During last year’s “merger of equals” with Allegheny Valley Bank, Standard Bank’s CEO Tim Zimmerman and his colleagues learned the value of pragmatism and team building. Now, he’ll apply this approach to his term as ICBA chairman, continuing the association’s fight for regulatory relief. When Tim Zimmerman began planning a merger of equals, the financials made perfect sense. Two Pittsburgh-area community banks with similar philosophies and about $450 million in assets each would combine to become a more formidable competitor. Of course, cost savings would be necessary to drive down the combined bank’s projected noninterest expense. No spreadsheet could have calculated just how challenging it would be to unite the two banks. Yet the endeavor has been more than worthwhile, says Zimmerman, and the project aligned well with his practical manner. Mover and shaker—Mover and shaker—Tim Zimmerman with wife Linda Zimmerman, ICBA’s EVP of member relations John McNair, and ICBA Securities president and CEO Jim Reber at Pennsylvania Association of Community Bankers’ 2012 annual convention in Vail, Colo.
Today, Zimmerman is CEO of $983 million-asset Standard Bank, which legally merged with Allegheny Valley Bank in April 2017, with customer account conversion in August. The institution enjoys a strong position as a commercial lender serving a small-business niche neglected by the big banks and the large regionals that dominate the market. But Zimmerman, ICBA’s incoming chairman, says it wasn’t easy to get there, and there’s still more to do. Grandfatherly pride—Zimmerman takes pride in his three grandchildren, (l-r) Britain, Reagan and Lennon Fisher. They started at the top, with essentially even numbers of board and management personnel from each bank. However, unlike when a smaller institution is folded into a larger one, Standard Bank had to choose which products, services and technologies to keep from each institution. The answer wasn’t always obvious, since both banks were profitable. Committees tasked with deciding which products and services to retain quickly became deadlocked. Each side was convinced its method was in customers’ best interests. There were even some challenges at the board level over corporate governance approaches. That meant looking at pricing and profitability issues or determining which bank had already gone the furthest with a particular product or service. Standard Bank’s president, Andy Hasley, the former president and CEO of Allegheny Valley Bank, was heavily involved in the process right from the beginning. Decisions were ultimately made, although it took far longer than originally anticipated, and some issues are still being resolved. It’s a tactic that worked for him when the Financial Accounting Standards Board (FASB) was developing the Current Expected Credit Loss (CECL) standard, which requires banks to account for credit losses at the point of loan origination. FASB was initially going to require complex modeling systems for institutions of all sizes, but it eventually relented and permitted community banks to continue using their personal understanding of local markets to determine loan-loss reserves, including qualitative factors, historical losses and spreadsheets. After all of the discussions and examples, Zimmerman was named as the sole community bank representative on the FASB’s Transition Resource Group, which is continuing to work on fine-tuning CECL. In the end, Zimmerman and other community bankers convinced FASB to make changes, a victory he attributes to respect, perseverance and patience. “What you do is say, ‘Here are the facts, and here is the reason,’ and the follow-up is, ‘Do you have any questions? Is there anything wrong with what I’m asking you to do? What’s the flaw?’ Then you can win them over,” he says. Zimmerman also found success serving as chairman of the Consumer Financial Protection Bureau’s Community Bank Advisory Council, explaining how overdraft practices actually benefit customers and defending balloon mortgages as a century-old tool when used prudently by community banks. He, along with ICBA and his community bank peers, also effectively advocated for community bank exceptions to the CFPB’s Ability-to-Repay mortgage lending rules, a two-year effort. Advancing regulatory relief, including ICBA’s Plan for Prosperity platform, is a top goal for Zimmerman during his chairmanship. “Part of my hope is to continue the work of ICBA and do even more to help community banks get back the ability to make decisions that are customer-oriented and not have to follow very restrictive and prescriptive methods, so that we can help as many people the best way we know how,” he says. Streamlining the regulatory burden was one reason Zimmerman pursued a merger. As a $488 million-asset bank with nine branches, Standard Bank had been an “awkward” size when it came to regulatory expectations and best practices like Dodd-Frank. Ally on the Hill—Zimmerman with Rep. Jeb Hensarling (R-Texas), chairman of the House Financial Services Committee, who has led the fight against Dodd-Frank. In October 2017, Hensarling announced he will not seek reelection after his term ends. It was also hard to grow. Standard Bank had tried for years to acquire a smaller community bank, but it was consistently outbid by larger institutions that didn’t have to worry as much about shareholder dilution. Allegheny Valley Bank had the same frustrations, bidding and losing on the same institutions. Instead of continuing to fight each other in the same losing battles, they decided to team up, making the most of their overlapping markets, with Allegheny Valley Bank operating in Pittsburgh’s urban market and Standard Bank thriving in both its suburbs and rural areas stretching to western Maryland. They also had similar portfolios. The merger was announced in August 2016. While Standard Bank isn’t a systemically important bank, Zimmerman believes it’s systemically important to the communities it serves, both for the financial services it provides and the work it does in the community. That includes programs for first-time homebuyers; Standard Charitable Foundation, which provides grants to support the local communities; and fundraising for the Make-A-Wish Foundation, an effort that over the years has raised more than $500,000 for the charity, granting more than 150 wishes to children with life-threatening illnesses. Focusing on that mission is what gave Standard Bank’s employees the wherewithal to keep going during an exhausting merger and systems conversion process. From April until August 2017, the banks continued to run parallel systems, with teams working long hours in separate locations. Now that the conversion is over and teams have been relocated to work together, they are becoming more cohesive as they focus on serving customers instead of ironing out internal processes. 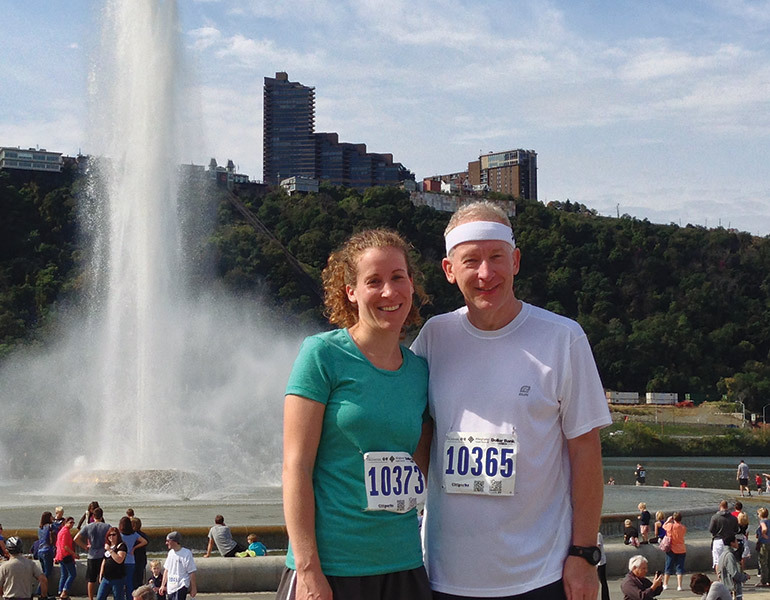 Race to the top—Zimmerman and his daughter, Julie Zimmerman, take a breather after running a race together. It’s this customer focus that drew Zimmerman to community banking in the first place when he tired of traveling from client to client as a CPA with a young family. He began at Landmark Savings Association in Pittsburgh in 1977 and joined Standard Bank as its president and CEO in 1992. Mad about the mouse—Tim Zimmerman at Disney World with (back row, l-r) son-in-law Ryan Fisher, daughter Tara Fisher, wife Linda Zimmerman, daughter Julie Zimmerman, (front row, l-r) grandson Lennon Fisher and granddaughters Britain and Reagan Fisher. Zimmerman’s observations have proven true, which is why he’s taken an active role in the industry, serving as chairman of ICBA Securities and secretary of ICBA’s Executive Committee from 2013 to 2015. He’s also past chairman of the association’s Mutual Bank Council and was chairman of ICBA’s Federal Home Loan Bank Task Force in 2011. On the state and local level, he has been a member of the Pennsylvania Association of Community Bankers for more than 20 years and served as a member of the state association’s board of directors for much of that time. He’d like to see more community bankers do the same. Q: What’s the one thing you’d tell a visitor to Pittsburgh to see? A: Ride the Incline up to Mount Washington and enjoy the spectacular view of the city and the Three Rivers. Q: How did you teach your kids about money? A: We taught them early on about saving a portion of all the funds they received—even gifts! A: My mom and dad. They personally [made sacrifices] and raised six kids on a shoestring and instilled core values in all of us. Also, my dad served in World War II and was seriously wounded in the Battle of the Bulge. He was part of the Greatest Generation; it brought a tear to his eye every time he saw the flag. Q: What’s your one piece of advice for community banks considering a merger? A: Consider all of the factors—financial and cultural—before moving ahead. Q: What’s been the biggest change in the banking industry since you joined in 1977? A: Definitely the technology and the amount of regulation. Pittsburgh is known for its rich cultural heritage—and philanthropists like the Heinz and Carnegie families that have supported the city’s arts scene for well over a century. Zimmerman contributes to the tradition as a longtime board member and vice president of the Pittsburgh Civic Light Opera (PCLO, pictured above), one of the nation’s premier regional theaters. It produces Broadway-level shows, brings in touring shows, provides a year-round cabaret and runs an academy of musical theater where students can learn every aspect of performance, including dance, voice, choreography and lighting. He’s also chairman of its audit and budget and finance committees. Zimmerman was brought in many years ago for his business expertise, though he isn’t without musical talent. He played in a band and a musical group in high school, and now he benefits from seeing how artistically creative minds work. “I’ve learned so much from people who are very creative and forward-looking, who have all kinds of talents on that side of the ledger,” he says. One challenge both PCLO and Standard Bank share is attracting younger audiences. As part of that effort, PCLO has been investing in the development of new musical theater productions. “There’s only so many times we can run Kiss Me Kate or The Sound of Music,” Zimmerman says. Standard Bank has done its own outreach, noticing a strong response when it promotes community service projects. Zimmerman knows community banks are a good match for millennials if only they can get the message.